Tonight on BBC4 they just showed a programme about Carl Faberge, blingster to the Czars. I learned a lot. Next up, a show done by Jonathan Meades, about Brutalist architecture. He’s for it. This seems an appropriate juxtaposition, and I am recording both. The insanely ornate and extravagant trinkets unleashed by Faberge, and all the other riche and nouveau riche junk that flooded into the world in and around 1900, had a direct cause-and-effect relationship with the anti-ornamental puritanism of architectural brutalism. 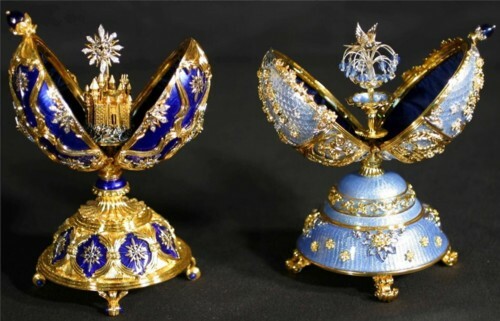 Many, including me, some of the time, react to Faberge eggs not just with indifference but with aggressive hatred. 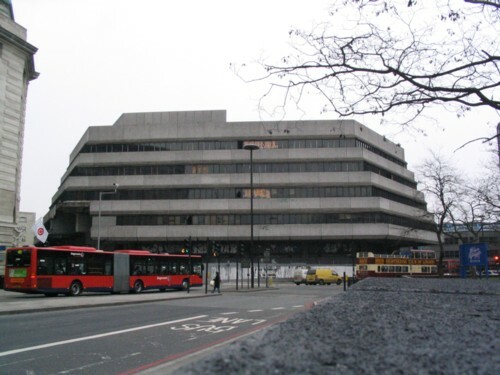 I also beheld Brutalist architecture for most of the last half century with even greater loathing. This loathing is only now abating, as the buildings themselves start to diminish in number. That building used to adorn the roundabout on the other side of the river from Parliament. It is now no more. I photographed it. Then, I photographed its demolition. I did not mourn its passing. Meades is now, as promised, rhapsodising about Brutalism. Why, he asks, does architecture have to be nice? He is likening it to Victorian architectural oddities of earlier times. What he misses, or is missing so far, is that Brutalism’s aesthetic aggression went hand in hand with huge collectivist power grabs. Brutalism was the architectural face of state centralism. For me, Meades makes a big distinction between “Brutalism” and regular modern. I don’t really see this. Both went hand in hand, I’d say. Meades’ injunction that people should not hate Brutalism is rather like expecting conquered Europeans not to be such philistines about the obviously beautiful design of Junkers 87s or Tiger Tanks. Ah, correction. Now he is acknowledging quite explicitly the roots of Brutalism in second world war concrete bunkers, most notably those constructed by the Nazis. “Forget” that the Nazis built these things, says Meades. But I suspect that the Brutalists actually liked the very quality that made the Nazis do this kind of thing. Nazis conquered twee old Europe. Brutalism assaulted the twee architecture of post-war Europe, the Europe that is still awash with Fabergerie. There is a deep affinity here. The show is still going as I post this, and is in any case only part one of two. This was live blogging.